Here I am adding Exposure, the "Source field" to the "Target field", Caption. 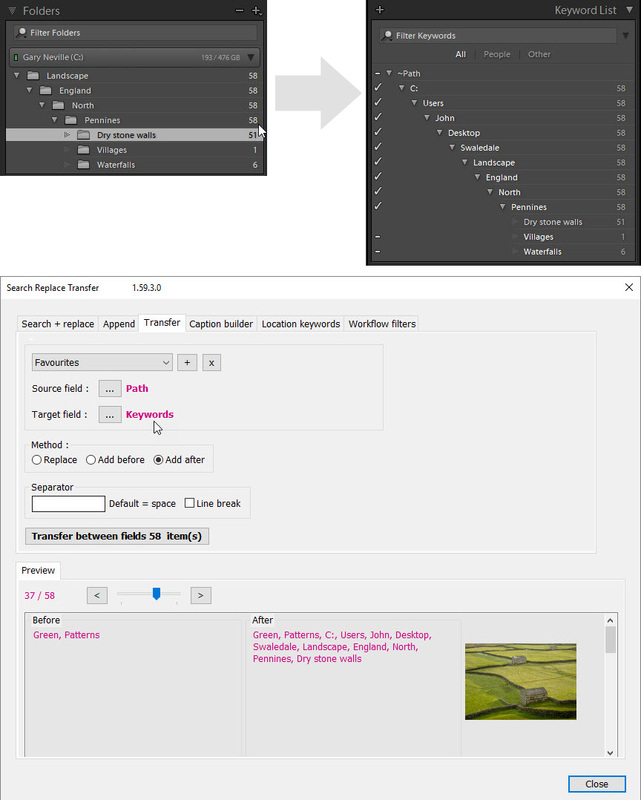 The Method is set to "Add after", meaning the Caption isn't replaced. I also added a line break between the Caption and the Exposure. In the Preview area, I can use the slider to run through all the selected photos and review the results. When I press the "Transfer between fields" button, the transfer is processed. Sometimes people have folder structures that they want to convert into keywords, and the plugin makes this relatively easy. When Path is selected as the source and Keywords as the target, the plugin converts each folder into a keyword. In this case the photos already have keywords "Green" and "Patterns", and choosing "Add after" adds the folder keywords to the existing keywords.